Note: Make sure to select the output voltage first before plugging cable for charging laptop. 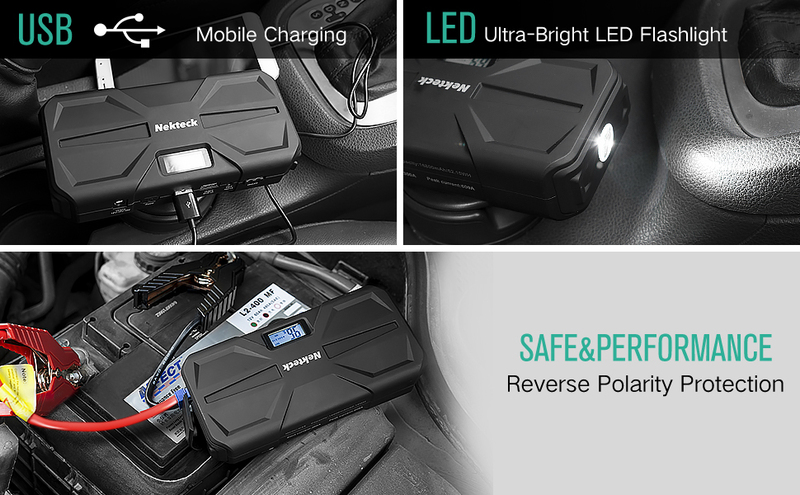 A powerful compact and convenient one of a kind charge-everything device that fits inside your pocket or glove compartment of your vehicle. Never worry about your smart phone or tablet running low on battery ever again. If your car won’t start, you don’t have to call a tow truck service for assistance. If you enjoy the outdoors you don’t need to bring an additional flashlight. The Nekteck Car jumper is the only thing you need to solve all of these problems. It’s the swiss army knives of portable power bank devices. It can power and charge all of your devices, start your car, and even save your life in the outdoors!A great travel companion that you can take with you on the go to charge all of your portable electronic devices, such as smart phones, tablets, cameras, camcorders, GPS unit, MP3 players, wireless headphones, and portable gaming systems. 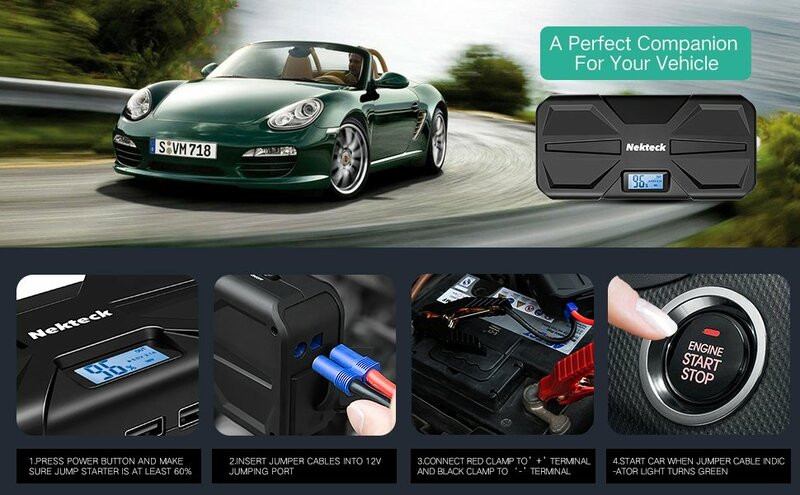 • Upon receiving new Jump starter, it’s strongly recommended to recharge the battery first for about 3~5 hours before using it (even though it's showing 100%). • There are only 8 laptop connector, none of them fit my laptop. Make sure it's over 25% charged first. The jump starter is advertised to jump start vehicle with engine 6L(Gas) 5L(Diesel) or under. Any vehicle exceed that displacement, the performance is not guaranteed. • Flashlight does not work. Check the battery level, if there is no battery, recharge the unit first.